Son of a French father and a Polish mother. He gave his first concert when he was only eight years old. Fryderyk loved Poland, but in 1831 he moved to Paris to pursue a career as a pianist and a composer. Fryderyk became Frédéric and political developments in Poland prevented his return and he was forced to stay in exile in France for the rest of his life. In 1838 he started a liaison with George Sand, the writer who had divorced her husband in 1836 and received celebrities in her salon at the Hôtel de France in Paris. At her country-seat he wrote his piano compositions. They were happy at first, but in 1846 Sand wrote to a friend that she spent seven of her eight years with Chopin as a virgin. She called him a sad angel. Despite his relatieve youth Chopin's health was failing and his last years were full of health problem. In 1849 he died of tuberculosis. He was buried at Père Lachaise in Paris, but his heart was brought to the Church of the Holy Cross in Warshaw. After his death many of his unpublished work was brought to Poland, where it was lost in a fire. 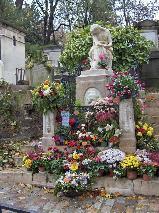 The grave of Frédéric Chopin at Père Lachaise, Paris.